Apart from the superb snorkeling and diving off Lankayan Island, another reason for coming here was to see the fantastic turtle conservation work that's taking place here, for green and hawksbill turtles. Once again you won't be surprised to hear they are endangered, ending up on the dining tables of many Chinese and Asian restaurants. 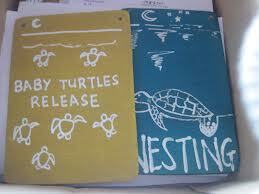 It has always been a dream of ours see a green turtle laying her eggs by the light of the moon. I still have the vivid image of the look of wonder on David Attenborough's face as he lay prone on the sand whispering gently to camera. We were very blessed and lucky and our wish was granted. 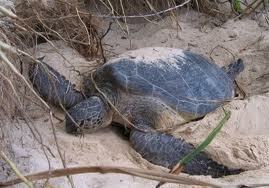 The turtles come up onto the beach at night so you had to be prepared to be roused from slumber to see them. We had to hang a little tag on our door, giving permission for staff to wake us up in the middle of the night. Our green turtle had no less than 82 eggs, about an average sized clutch. She used her flipper to dig a deep hole and began laying what looked like shiny ping pong balls. It took her nearly 2 hours. We sat transfixed and I honestly don't know where those 2 hours went. She was so focused and never even gave us a second glance. By the end she was clearly exhausted and breathing quite heavily but her hard labours were far from finished. She then spent another hour using her flippers once more to bury her eggs. Every now and again she would stop and take a breather and every now and again a perfectly targeted flip of the sand would smack you square in the face! I felt for her, felt her weariness, in awe of her. She would never see her babies born, she will never know if they made it to the sea or not. Utterly spent, she heaves her exhausted frame towards the water and just as she gets to the water's edge she stops and looks out at the revitalising water for a while before gliding effortlessly into the night. As soon as she is gone. The staff dig up the eggs (she will never know!) and take them to safety in the hatchery where they re-bury them deep into the sand. It will take 55 days before the little babies start to peep their heads out of the sand where they will be released into sea. We adopted that clutch of eggs. We can't wait to hear of their safe release. Not all 82 will hatch, 50 would be a good result. Everything crossed. 10th December we should know. During our stay we were also lucky to see some baby turtles hatch and be released. It was incredibly moving to see the first little baby peek it's head through the sand and then a frenzy of scrabbling ensues as his brothers and sisters quickly follow. Gareth was given the honour of carry the babies to the water's edge, a charge he took very seriously. First little babies poke their noses through the sand. We all watch with joy as they scramble erratically towards the sea, how do they know exactly what to do? Just minutes ago they were buried in the sand! 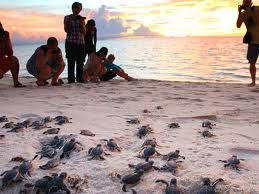 The sobering thought however is this: 483 turtles laid their eggs on Lankayan island last year. Approximately 40,000 babies were released into the sea. Only 1 in a thousand will survive to adult hood, that's just 40 of them and half of them will be caught for the table. Now you see what odds these beautiful and graceful creatures have to face to survive. Lankayan's work is to be celebrated and most of all supported. "Borneo is like an onion, the more you peel back the layers, the more you weep"
Not a positive start I thought but he did have a point. The rain forest is so beautiful and bursting with life, light and sound. Vibrant orchids, flowering ferns, fascinating pitcher plants and towering trees are abound. 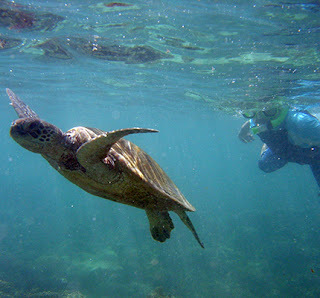 The islands of Bunga Raya and Lankayan are unrivalled in their natural beauty. In stark contrast you have the towns where brash, opulent hotels and shopping centres shadow the seething slums beside them. 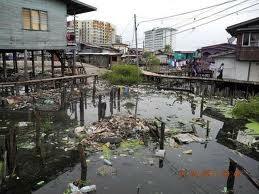 Many of the slums house illegal immigrants from the Philippines and are water logged, filthy and diseased. Toddlers wade around knee deep and manged, skeletal dogs lie everywhere. On every street corner there appears to be a MacDonalds or a KFC where teenagers from the slums like to hang out without a hope of ever being able to afford a Big Mac. Like teenagers from any culture in the world, they just want to fit in and be part of the "crowd" and this is the closest they will get. Many of them are off their heads from sniffing glue from plastic bags and I found that so sad and shocking. It's desperate. Their sense of hopelessness is palpable. This is a different form of poverty from the kind we saw in Tanzania for example. Albeit, equally as appalling, you get the impression everyone is pretty much in the same boat and there is a sense of "lets get on with it" resignation. Here in Borneo, these kids are taunted by the very things they haven't got every single day and a life they will never have. Affluent tourists and Malaysians pour out of the shopping centres draped in bags from designer outlets and straight into waiting taxis. No wonder they resort to crime and desperate measures for a piece of the cake we are privileged to eat. You need a strong stomach for this. Borneo was such a roller coaster. Orangutan means "Man of the Forest" in Malay. They were our main motivation for organising this trip to Borneo. They are so like us in their mannerisms and they display exactly the same emotions as we do. Well why wouldn't they? We share a staggering 96.4% of our genetic profile with them. 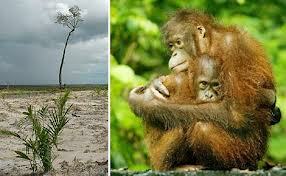 Like so many of our beautiful creatures, Orangutans in Borneo are seriously endangered. At the hands of man once more. Maybe this is our last chance to see them in the wild. 1000's of miles of beautiful indigenous rain forest has been systematically burnt down to make way for huge Palm Oil plantations. It was distressing to drive past nothing but palm trees for hundreds of miles. Palm trees are useless to Orangutans and many other primates birds and animals. 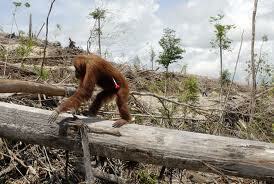 So many are killed as the rain forest is clear felled and burnt to the ground. 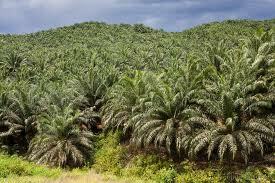 Shame on you Nestle, one of the biggest users of Palm oil. It sickens me even more that Nestle try to smokescreen their involvement in this industry by setting up a charity to "Save the Rain forest". What kind of perverted PR is that? A lucky few are thankfully rescued and often in a most traumatised state, they are taken to the Sepilok Orangutan Rehabilitation Centre. Sepilok is a treasure. The Orangutans are properly cared for but are encouraged to remain as wild as possible in order to re-introduce them back to the wild one day. Sepilok has become such a hit with Orangutans that wild ones regularly wander in for a feed and a bit of a social get together and many of the rehabiliated ones choose never to leave. 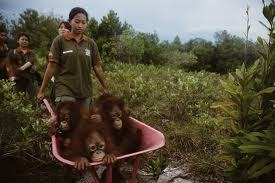 The wild Orangutan are never turned away as they teach the rescued babies proper Orangutan behaviour. Baby Orangutans are the most heart melting, most human-like babies I have ever seen and the maternal feelings I had towards them was overwhelming. This time, we were so lucky on our visit to encounter Ringo. Ringo is 24 years old and a wild, strong alpha male. It is only the second time this year that he has come to the reserve. He was awesome, in the true sense of that word. My "Man of the Forest" lol! As Ringo approaches, my jaw drops. Wow, he is one impressive hulk of a male. The ranger retreats. Ringo will not come if he is there. Even though Ringo is 4 times stronger than a man, his fear of man is sadly imprinted. He knows we are there but we are on a viewing platform some distance away and over time he has learnt that people on the platform are no threat and he just ignores us. The other male Orangutans bid a hasty retreat. He is the dominant Alpha and he will not tolerate other males at his table. He checks out one female to see if she is ready for mating. That was rather intimate viewing I have to say, their behaviour is almost identical to ours so I will leave that to your imagination! She was not ready but he decided she could share his table anyway. She was very deferant and mirrored his movements exactly as a show of respect and subservience. The other females danced and swung around him to attract his attention but they were ignored. They sneakily grabbed pieces of fruit when he wasn't looking. Ringo occasionally got up to look around him should any other male have the affrontery to come near. Worth coping will all of my 23 mossie bites for and the other bumpy rides on this trip. I hope this moves you to help them, they can't do this on their own and if it does, you can do it by clicking here. This two week trip packs in quite an itinerary. The first few days however are all about no news, no shoes and kicking back with a great read. I have a brilliant read. The Guernsey Literary and Potato Peel Pie Society. It's a stunner and one my momma in law HAS to read. No correction everyone has to read it. Get it. After 2 flights and a speed boat transfer we reach the island paradise of Bunga Raya. Nestled in the secluded bay of Gayan Island it is exactly the tropical idyll we hoped for. We are quickly shown to our beach bungalow with it's lovely sheltered sun deck and plunge pool which looks out onto talcum powder sand and a crystal clear blue expanse of the South China Sea. Impatient to plunge, we jump in just wearing our undies. Our bags are en route from the boat and we don't wait a second longer. There is a flowing brook just below us, so pretty but we both know that come dusk, it will be a seething pool of mossies! A crane stalks with purpose and the frog has a just in time escape, tench dart frantically, a monitor lizard rustles steadily through the leaves for juicy grubs and a vibrant, crimson butterfly settles on a nearby twig. Just lovely. The humidity here is intense. Beads of perspiration pour from your head and nestle in pools at your elbow creases, back of the knees and down your back. My face has a persistent pink glisten and we won't even mention what happens to my hair! Just embrace the frizz. The sea is a staggering 30 degrees Celsius. Just a huge warm, salty bath conducive to nothing more strenuous than languishing lazily in a laissez-faire fashion. Right now the summit of the mountain seems worlds away but even whilst we enjoy these first 3 days of R&R, the extent of our forthcoming exertion is never far from our minds. Sorry there aren't more photos. If you read our story you will see why. Even though our climb of Mt. Kinabalu was a few days into our trip, I have decided to post about it first of all. A lot of preparation, research and a good dose of angst (mainly from me) went into our efforts on this climb. I read every blog entry I could find about those who had already done the climb. I knew the initial few kilometres comprised of very steep steps into the rock. I knew it would be very hot and humid so plenty of sunblock was required and shorts would be fine initially. I knew warmer clothes would be needed higher up as it turns extremely cold. I knew we had to start off very slowly as we would need that energy reserve later. I knew to respect the altitude and heed the symptoms of altitude sickness. I felt I had a fairly good idea of what to expect and most people's experiences seemed to be consistent. I trained hard at the gym and my fitness was never an issue. (Thanks Vibrobody). Hubster was absolutely fine too, the mountain goat that he is! When we set off the whole of the mountain was shrouded in thick cloud. No chance of seeing our nemesis before we started. It was dank and drizzling. After 4km up, 3.5 hours in, we were battling a downward torrent of muddy rain water and we could clearly hear the wind howling and whistling as we started to emerge out of the tree canopy. A little weary and in need of sustenance we stopped at the makeshift hut. We nibbled on a few boiled eggs, drank some water and noted Sepison, our guide, was looking concerned. I found the howling wind disconcerting and I was already very cold. Hubster and I exchanged looks but not words. "Bloody wonderful eh? Not!" The tips of my fingers were shrivelled like they do when you have been in the bath too long and as I get Reynauds Disease, they were also white, devoid of circulation and I could not feel my grip on my walking poles. I presented my hands to my Hubster and he immediately clasped my fingers in his cupped hands and blew hot breath onto them. I did windmills with my arms to pump the blood through too. A tried and tested routine, normally performed on a ski slope at about -10. Sepison, our guide was on his radio. Forlorn people were strewn around us, visibility was getting poorer and one lady was in floods of tears and screaming in German at her partner. This was tough. This was not fun at all. Disgruntled I thought "This isn't how it's supposed to be, I never read this scenario, this isn't like rain that I have ever experienced". Indeed it wasn't. "No good" Sepison said. "Big typhoon, no can summit, too dangerous. No for me" Now these guides do not abort a climb lightly, if they don't take clients to the top, they don't get fully paid and money is hard earned in Borneo. 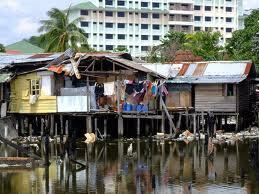 It is an extremely poor country. We understood every word he said and we knew in our heart of hearts he was right and we know from experience that you NEVER lose respect for the mountain because the mountain will always win but even in our sodden, bedraggled state, disappointment washed over us. There was no point carrying on. The weather was going to get worse and the slope to the summit would turn into a torrenting waterfall - impossible. We turned our heels and started the descent down. It was terrible, so much harder than the climb. The rain water was now so high it covered the tops of our boots and our feet were soaking wet, blisters were inevitable now. It was hard to see a decent footing and it was extremely slippy, every step down was precarious. We all fell into a determined and focused silence. One step, two step, three step down and for some daft reason the tune "hit the road jack" just whirred around my head. With just one more kilometre to go my right knee felt like it was going to burst apart, I had turned over on my ankle a few times as the water had loosened the smaller rocks beneath our feet. We would have fallen many times for sure if it hadn't been for our walking poles taking up some of the pressure on the downward step. By the time we reached the bottom I was shivering with cold from the pit of my stomach, my teeth were chattering uncontrollably and I felt a little nauseous. We had to wait for the bus to take us back to the main gate. After half an hour, still no bus. The water poured off our foreheads, noses and chins like we were fully clothed under a cold power shower whilst standing in a wind tunnel. I could bear it no longer. I told Sepison, I'm walking back. If the bus comes, stop to pick me up, I need to keep moving, generate some warmth or I will pass out. Hubster knew not to second question my decision. He always knows when my dark brown eyes turn black (he says), I am resolute. Sepison was bewildered and flustered. Kept muttering sorry and touching his heart. It wasn't his fault at all but I didn't have the energy to reassure him. We would pay him anyway and all would be well in the end. I fantasised about the plunge pool at Bunga Ray and vowed never to complain about being too hot again. Not one of the other 145 made it either. But we did our best and had it not been for Mother Nature throwing a wobbly, I know we would have made it.